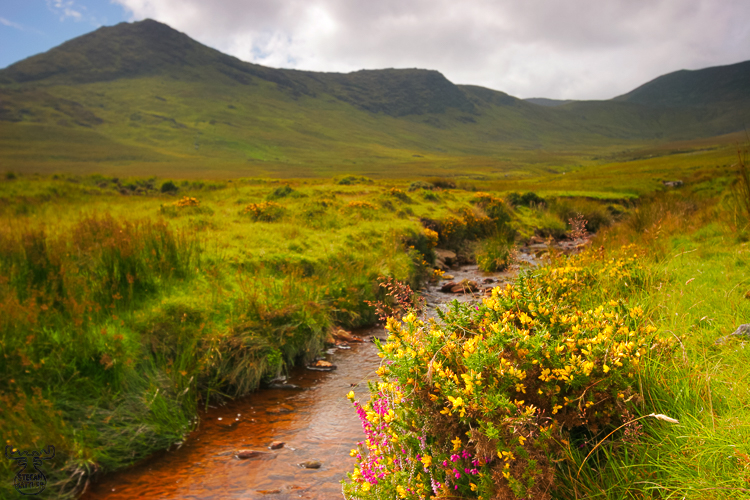 A beautiful landscape in decent weather - Irish green featuring Irland's nickname "Emerald Isle", peat-brown water, hills and the country's typical cloudy, yet nice and sunlit sky. This view can be found in the Inny valley, in fact very close to the most populated touristic areas of Ireland - the Ring of Kerry. But only close. While sightseeing busses more or less invariably take the main ring around the peninsula, we used a smaller road to the East, 3km North of Waterville, into the center towards the Balaghisheen Pass and then North to Lough Caragh / Glenbeigh. Less traffic, less people, more nature.